This thematic unit presents information about two habitats and some of the animals found in each. Background information on each habitat is included. There are opportunities for students to investigate, think, discuss and learn. Questions to focus attention are included. Starting with habitat awareness, activities and projects branch across the curriculum. 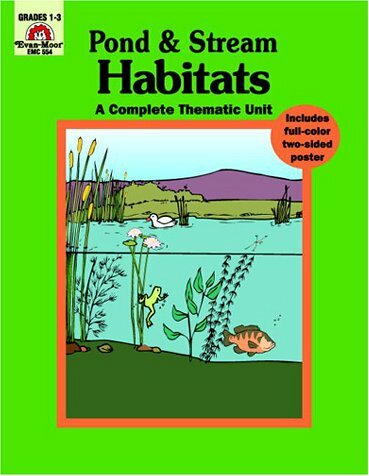 Topics and activities explored include: Getting Started (What is a habitat? An introductory discussion. 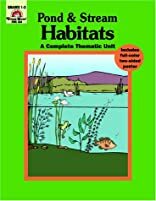 Analyze your habitat), A Pond Habitat, Life In Layers (an illustration of a cross section of a pond and cut-out Picture Cards of pond inhabitants, such as a whirligig beetle, a clam, a crayfish, a bass, a frog, a beaver, a duck, and a water fern, to go with it), Bottom Dwellers, Visit a Pond Environment (including making a pond scope out of readily available materials), Open Water, The Water's Skin, Surface Film, Pond Plants, A Stream, Differences in Plants, Collecting Pond Plant Specimens, The Frog (leading a double life), Raising Frogs, The Life Cycle of a Frog (with informational picture cards), Writing About Frogs, Diamonte Writing Form, Turtles, Turtles in Fact and Fiction, Make a Creeping Turtle (a craft project), Ducks, Duck Dialogue (writing), Beavers (engineers of the pond), A Beaver Builds a Dam Pop-up Book, Fish, A Fish Portrait (anatomy, how to make a fish print), Winter in the Water, A Pond and Stream of Your Own (follow-up activities for the book In the Small, Small Pond by Denise Fleming), illustrated pages for a student-made book titled A Stream Becomes a Pond, and Protect Pond and Stream Habitats. Also features a full-color, two-sided pull-out poster depicting A Pond on one side and Moving Water, Still Water on the other. Includes bibliography, and complete step-by-step instructions for all activities. Generous, accurate illustrations throughout of habitats and their inhabitants. All pages are reproducible and perforated for easy removal. About Rick Law (Illustrator) : Rick Law is a published illustrator of children's books. A published credit of Rick Law is Pond and Stream : Habitats.